Sapphire – Wireless Ordering eMenu is an intuitive restaurant food-ordering app taking the dining experience to the next level. It’s extremely easy to use with user-friendly multi-touch iPad, it will dazzle your diners and customers with its ease of use and at the same time reduce staff serving time by empowering customers to select food items on their own. Sapphire eMenu is integrated with our Jade – Next Gen. POS system to ensure a seamless end-to-end link from ordering to printing to payment. Orders are sent immediately to the kitchen without human intervention. Sapphire eMenu can also serve as a stand-alone menu to provide information about the food and restaurant to the customers. Getting Sapphire eMenu up and running is simple and intuitive. 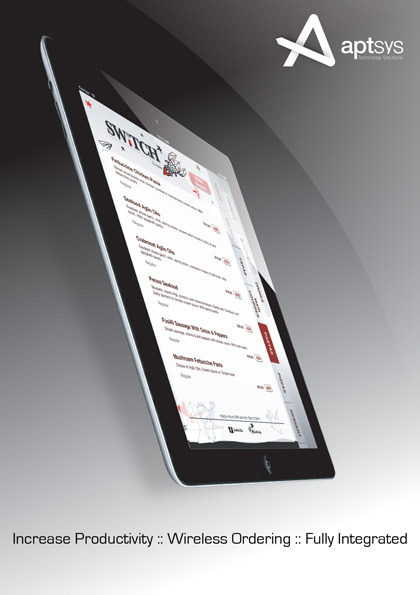 Whether you are creating menus for the first time, or making changes to an existing menu, everything can be done quickly and efficiently on the iPad or by simply logging to the cloud-based Content Management System (CMS) to create and update menu items, descriptions and prices using the step-by-step wizard functionality. Food and beverage images can also be quickly and efficiently uploaded directly on to the Gems cloud database. In Sapphire eMenu, it’s easy to set up breakfast, lunch and dinner set meals. Moreover, menu item prices can be set in advance to change based on various time slots i.e. lunch time specials, weekday specials, special promotional periods and holiday periods. 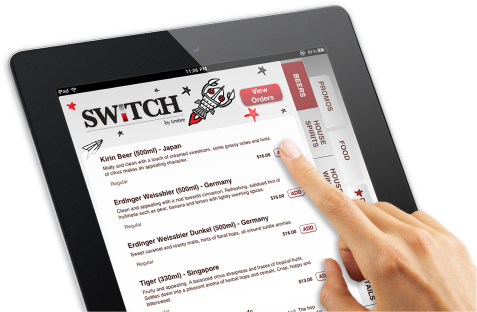 Sapphire eMenu is not just an electronic menu ordering platform, but its more than that. Using the iPad’s incredible graphic and video capabilities, restaurant owners can provide a full visual and audio experience for customers to enjoy. Beautiful food and beverage images combined with deliciously written descriptions have proven to help restaurants to up-sell and increase revenue. Sapphire completely changes restaurant operations. Wait staffs will have more time to interact and provide personal attention to the customers. It can also operate ‘offline’, so that customers can navigate through the menu faster without waiting for the eMenu to load each page. 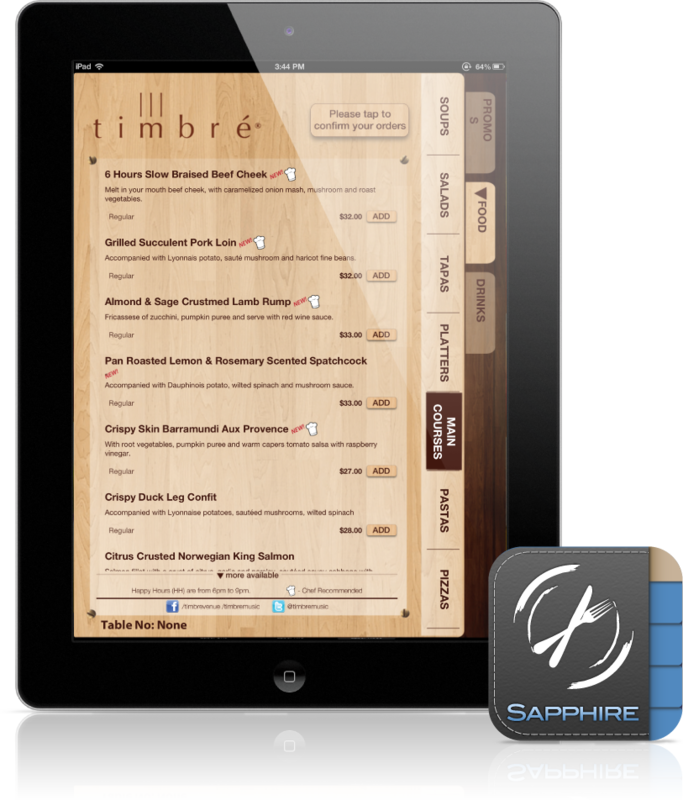 The Sapphire eMenu can be customized to fit the relevant restaurant brand’s requirement. Our talented and creative Graphic Designers are here to help you customize beautiful and elegant Graphic User Interface to complement your eMenu, at the same time totally enhance your restaurant branding. Sapphire eMenu, like any iOS app, will grow over time with iOS software updates promoting new features like wine pairing etc and continue to enhance the dining experience as well as increase operational efficiency.